The industrial age taught us that research and development are key to finding efficient and effective solutions but the cost and permanence of architecture makes it difficult for architects to experiment and prototype. This is why most architectural theory has always lived in books rather than in buildings. But In 1945 the visionary editor of the Arts and Architecture Magazine, John Entenza, sought to change this by creating a platform for architects to test and refine their ideas in order to find a suitable solution for post-war living in America. And so the unprecedented Case Study House Program (CSHP) was born. This three-part series will delve into the program and take a look at some of the houses that were produced. The CSHP ran from 1945 -1966 and during this period 36 speculative houses were built in the greater Los Angeles area. To kick off the program the magazine invited eight architects, who practiced locally, to participate, namely J.R Davidson, Richard Neutra, Sumner Spaulding, Eero Saarinen, Charles Eames, William Wilson Wurster, Ralph Rapson and Thorton Abell. The brief was to design a free standing single family home that was an ‘expression of man’s life in the modern world’. The budget was limited in order to provide examples of different housing models which the average, middle-class, American could afford. The design was to be capable of duplication and make use of new materials and innovative building techniques. The magazine would then showcase one of the house designs in each monthly issue. The construction process was also documented and once complete the houses were open to the public for a period of 6-8 weeks. Allowing people to experience the building was a way to show the public that modern houses were actually livable and not just fancy statements. This is also why the magazine chose to break with architectural tradition in the photographic representation of the houses and show people occupying the space. The famous photographs of Julius Schulman managed to capture the lifestyle that a modern home could provide. This helped to set up the association of modern architecture with progress and the good life. The CSHP offered a wide range of solutions to the same brief, which is what made it such an informative project. It gave architects the platform to test their ideas about modern architecture without the constraints of reality which resulted in many innovative and new ideas. The physical manifestation of the projects also gave them a tangible opportunity to experiment with different structural systems, detailing and materials. Each permutation provided a valuable lesson to our shared architectural body of knowledge, which is really what helps to improve architecture. When the Charles and Ray Eames moved to California in 1941 they quickly became friends with John Entenza and in the following years became very involved with the creative input of the magazine. Charles was instrumental in setting out the objectives of the program and so was naturally assigned by Entenza as one of the first eight architects. He was allocated a plot of land on a five-acre property in the pacific palisades which stood atop a large cliff overlooking the ocean. This is where he would later build a house, for himself and Ray, which promoted the ideals of modernism. 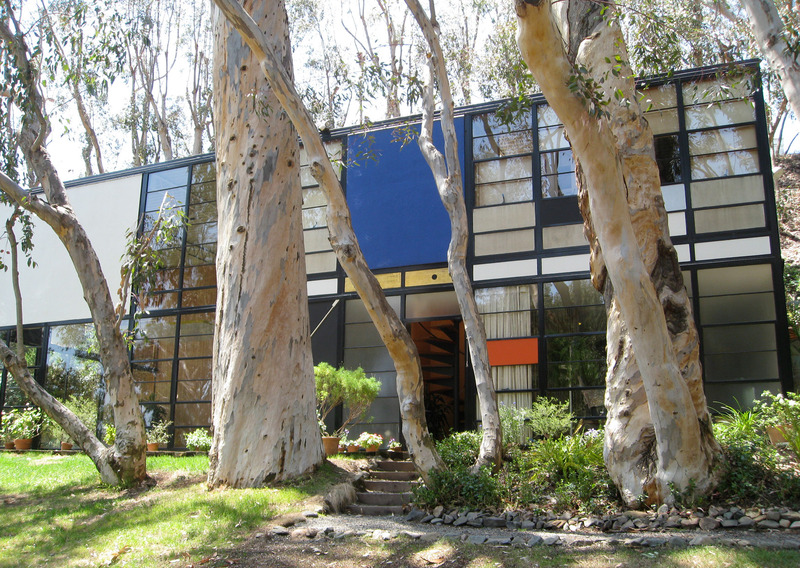 The Eames house, which was completed in 1949, was the first case study house to have a complete steel structure. Eames usually design for masonry construction but he was inspired to test out this new material after attending an exhibition at the Museum of Modern Art in New York showcasing the work of Mies van der Rohe. The plan accommodated spaces for working and living by creating two different masses separated by a patio. The composition of the steel structure was based on the duplication of a single bay that measured 2.3m wide, 6m long and 5 m high. Eames consciously expressed the character of steel by designing a structural frame that was remarkably thin. H-columns formed the main vertical support while open web joists support the corrugated metal roof sheeting, which is left exposed. The prefabrication of all the parts means that the entire main frame was erected in just one day. The elevations of this simple box-building were articulated by the fenestration system. Eames used a combination of clear glazing, translucent laminate and cladding boards, painted in primary colours (think de stijl), to control natural light and frame selected views. The service area for the each of the spaces faces the central court allowing for the double volume living and studio spaces to have outward views. The eucalyptus trees, which were planted in front of the house to provide privacy and shade, have now become an integral part of the appearance of the building. The Eames house was the first design to really fulfill the brief in terms of the use of prefabricated materials and new building techniques. The design had an important impact on architecture in Europe as it proved that the industrial ideal could have a human face. The building is clearly modern in its expression of material and structure but the plan does not create the ‘universal space’ that typically came with modern steel and glass buildings. Instead, the way that Eames’ dealt with the organisation of the programme showed that modernism could indeed be personalised. The building was well received by the public and definitely had a hand in changing the prejudice against the modern aesthetic. Although steel is a more expensive material the high strength to weight ratio meant that buildings needed less structural elements and the rapid speed of erection translated into a valuable cost benefit. The fact that all steel parts are prefabricated meant that houses could be easily and swiftly mass-produced to meet demands of the predicted housing crisis post World War II. It was the hope of most modernist architects that steel would be the standard building material of the typical American family house but unfortunately the American construction industry did not agree. It seemed like traditional building methods were too deeply ingrained to adapt so quickly to such a radical change. Furthermore, the trade unions would not endorse steel construction because the ease of construction would threaten hundreds of jobs. The Eames House is easily recognized today as one of the pioneering pieces of ephemeral architecture. The use of everyday material sparked a new school of thought and approach to construction methodologies at the time. It is a mid century masterpiece that changed our perception of space and yet, not many people are aware that it was all conceptualized as a simple case study competition entry.